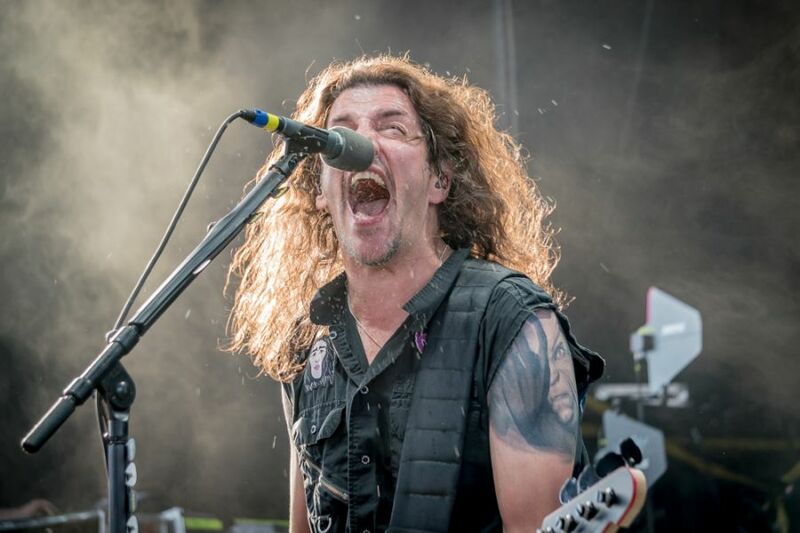 Critical Bill Releases New Video For "Alone Or Lonely"
Slayer unleashes a night of iconic thrash at Freedom Hill in Sterling Heights on their final tour of the planet with Lamb of God, Anthrax, Behemoth, and Testament. 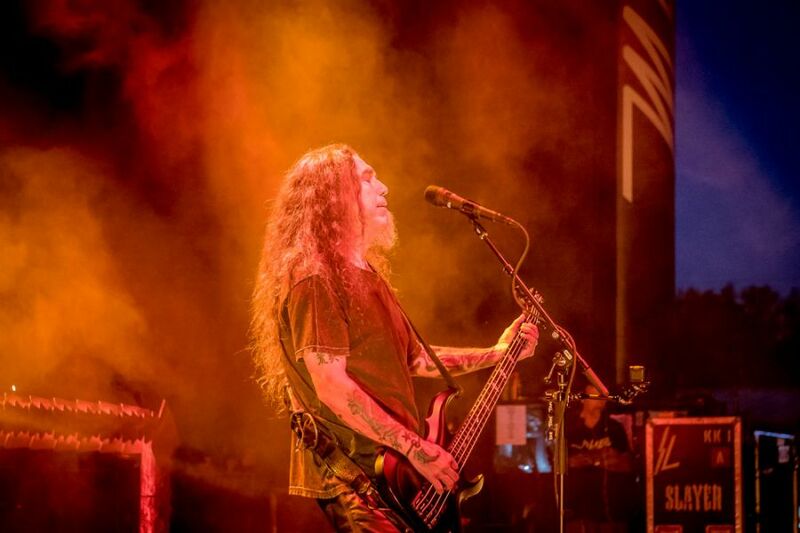 You would be hard-pressed to find a metal show that had a more enthusiastic crowd than the loyal legion of fans who have arrived at the Michigan Lottery Amphitheatre to see Slayer’s final world tour. 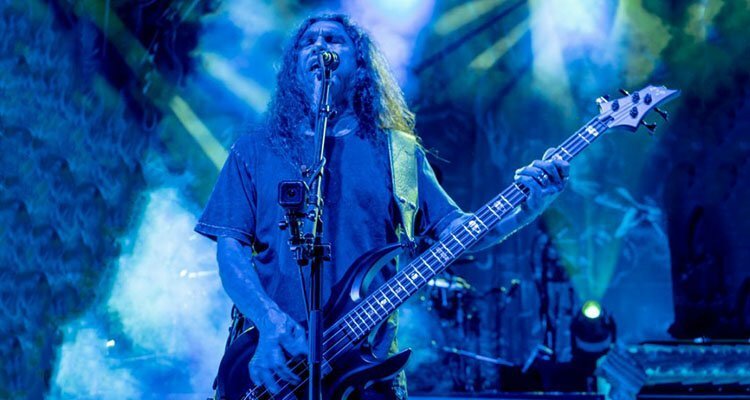 Over 37 years, Slayer has crafted some of the most recognizable music in the world. 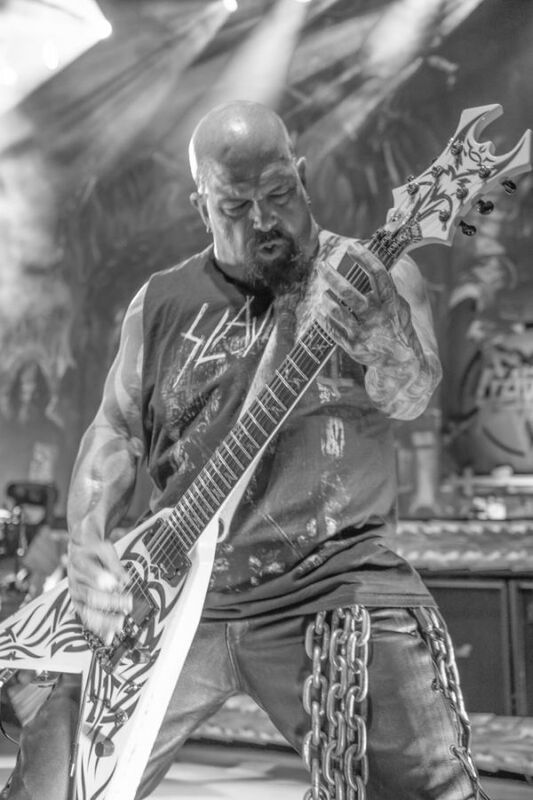 The music of Slayer allows their fans to escape the turmoil of life and release the rage of existence. 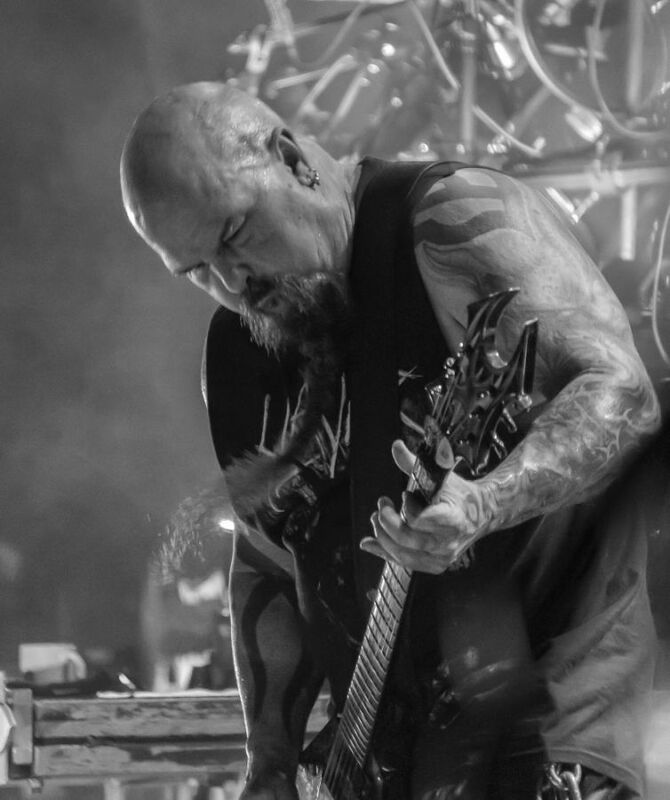 On this evening, fans are ready to raise hell with Slayer and the epic line-up of supporting metal bands they have brought on this tour.  Opening this festival of metal mayhem is Testament. Yes, you read that correctly. 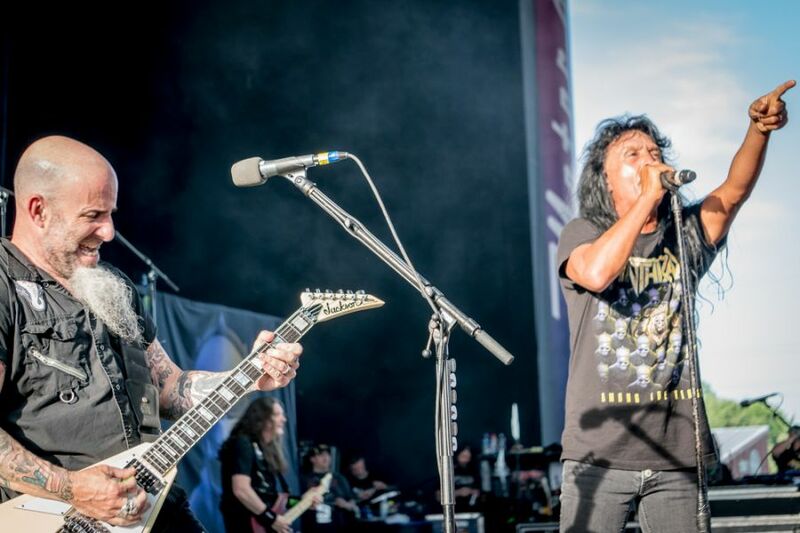 Testament is opening the show and it is clear from the minute they walk on stage that they are ready to thrash. 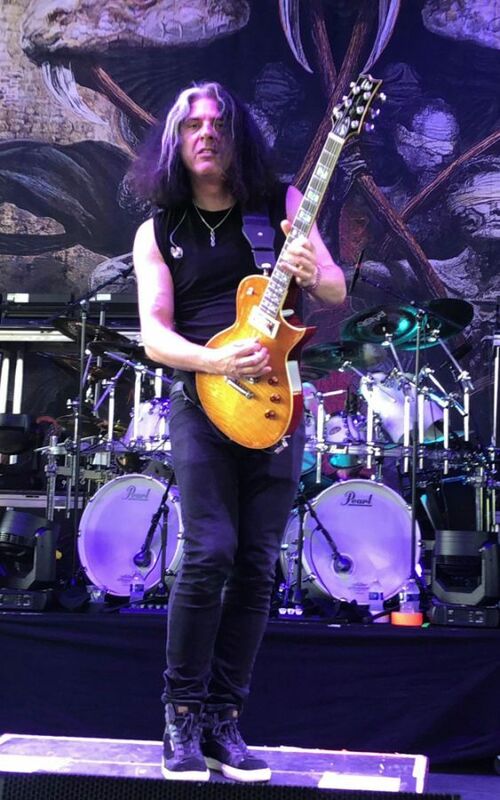 The early start to the show meant that quite a few fans had to race to their seats when they heard the opening notes of “Brotherhood Of The Snake” from their most recent and stunning album of the same name. 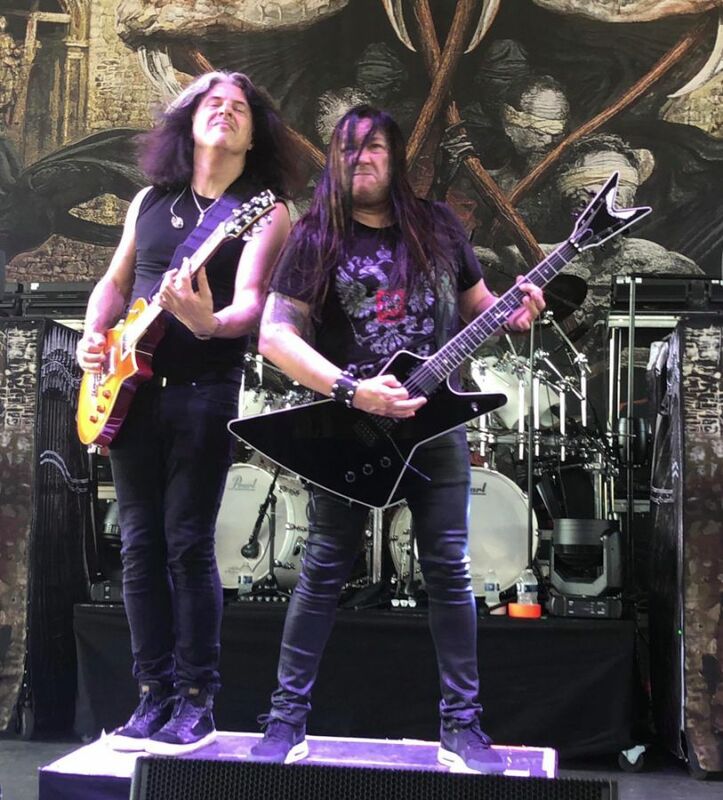 Alex Skolnick and Eric Peterson beckon to the roaring crowd while laying down the bone shattering riffs on “Practice What You Preach” and “Pale King”. 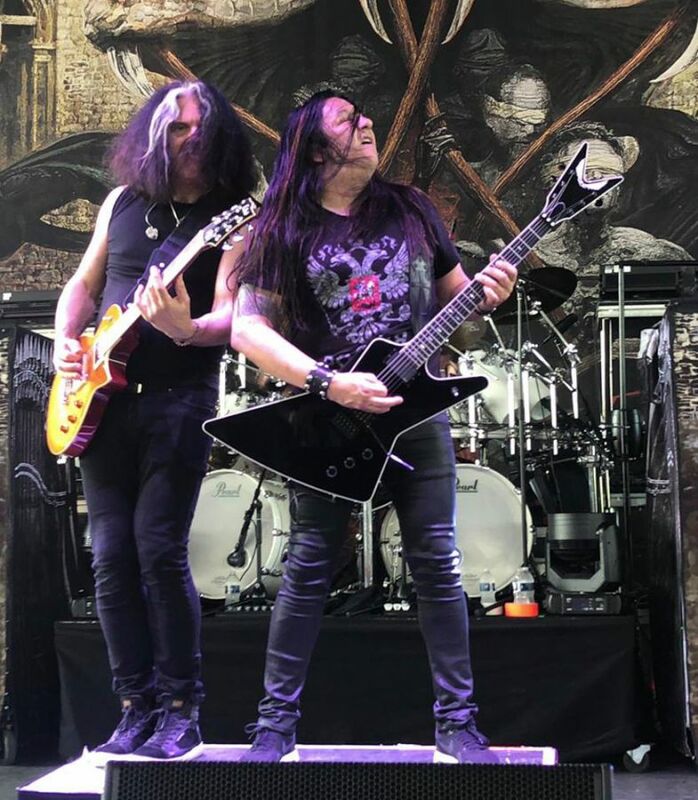 Testament has arguably the best rhythm section in metal with Steve DiGiorgio’s monstrous bass and mean Gene Hoglan’s pulverizing drums. 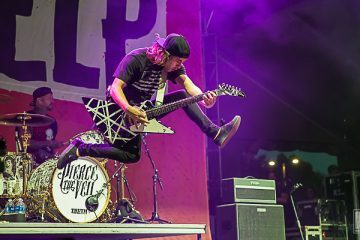 Their dynamic playing propels mosh pits up near the stage and back on top of the hill in the lawn section. 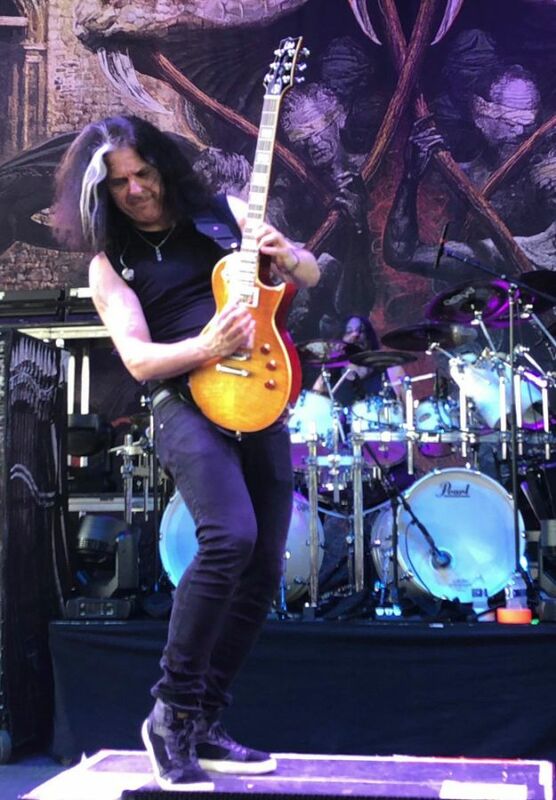 The master of ceremonies, Chuck Billy roars life into “Disciples Of Watch” to close out their set. 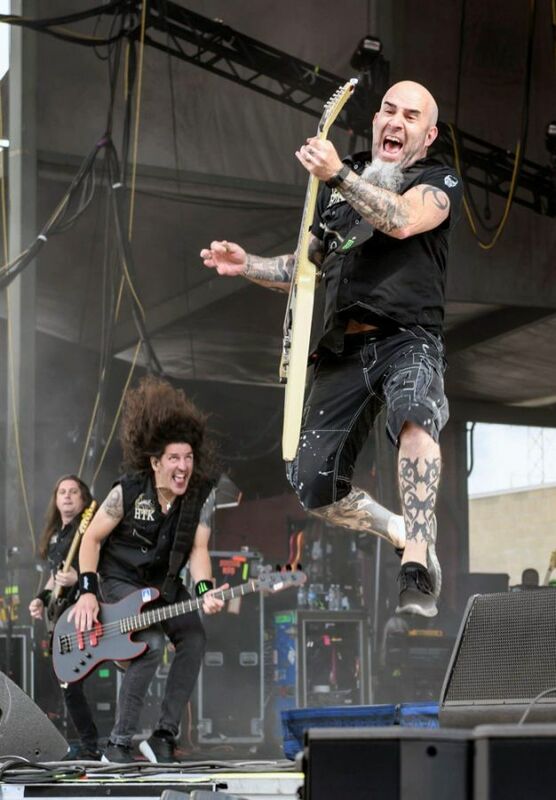 The looks of sheer joy on the faces of the guys in Testament during this performance is worth the price of admission. The stage crew quickly rolled out the demonic stage set for the next act, Behemoth. 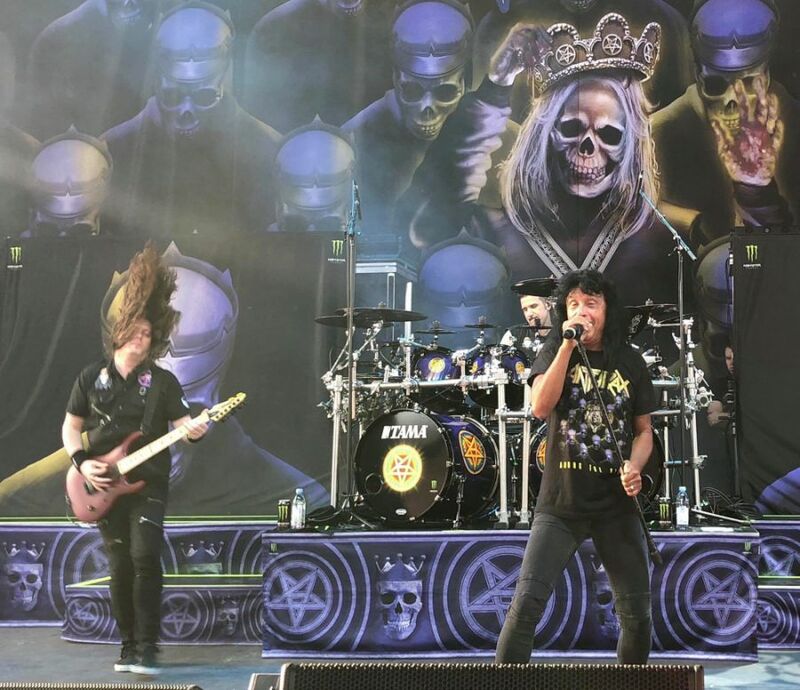 The band emerge on the stage with death white faces suggesting they have returned from the sixth circle of Hell to preach the word of Satan. 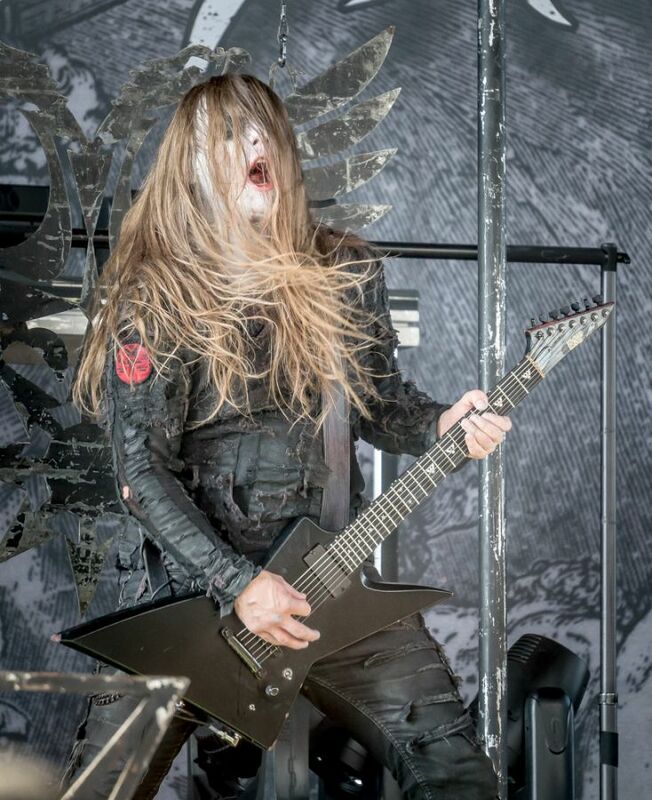 The blazing single note guitars of Nergal and Patryk Sztyber invite the inferno as Behemoth opens the set with “Ov Fire and the Void” from The Satanist. 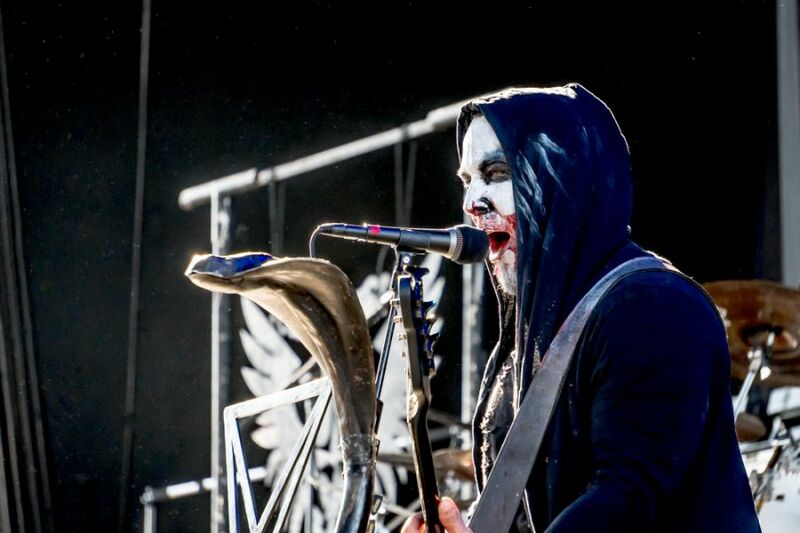 Tomasz Wróblewski spits blood into the air while unleashing furious bass lines. 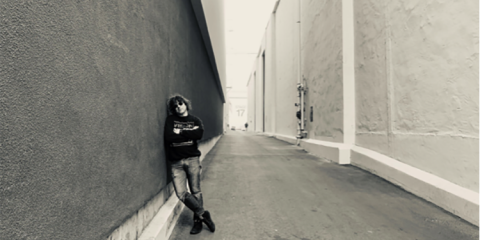 The guitars and bass are made potent with the blasting waves of drums from Robert Promiński. 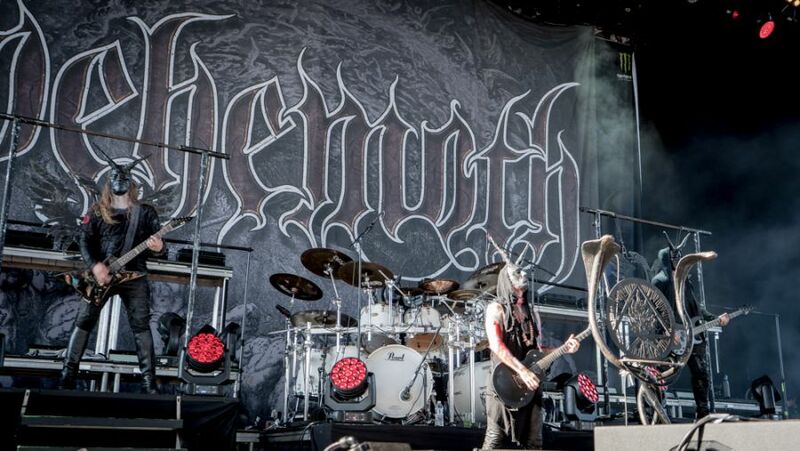 Fans continue to throw the horns into the air and swirl within the mosh pits as Behemoth plays “Ora Pro Nobis Lucifer”. 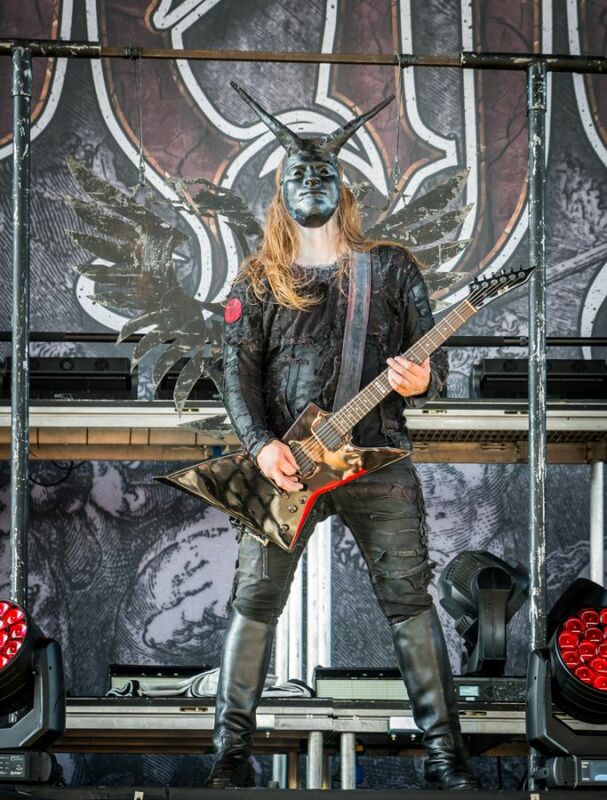 Wearing the mask of the goat they call an end to their sermon with “O Father O Satan O Sun!”. 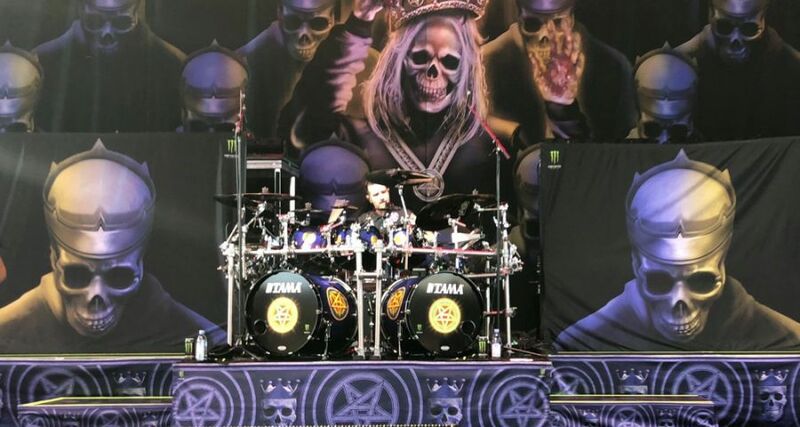 Rumors circulated before the show that Anthrax drummer Charlie Benante wouldn’t be playing due to recurrence of issues with his wrists. 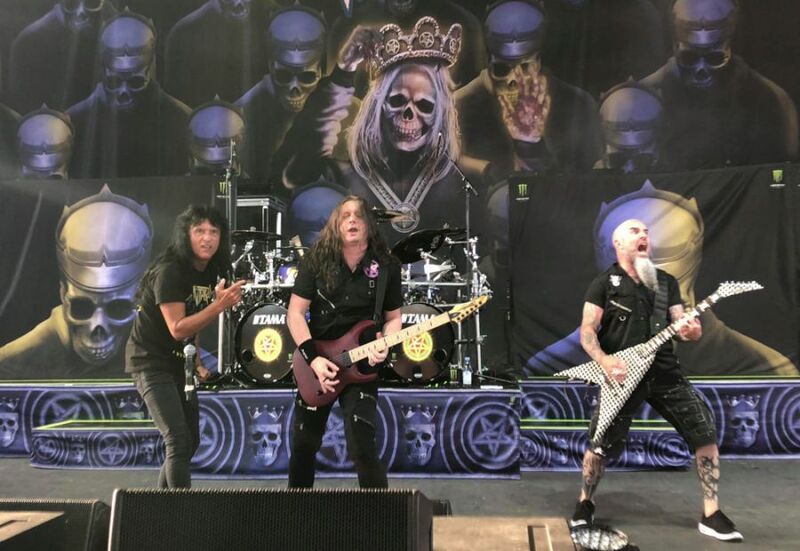 Upon seeing Charlie taking his place behind his kit, the crowd erupts with cheers and Anthrax jumps into the fray with “Caught In A Mosh”. The pit churns with moshers bouncing off each other while hardy souls surf the crowd. 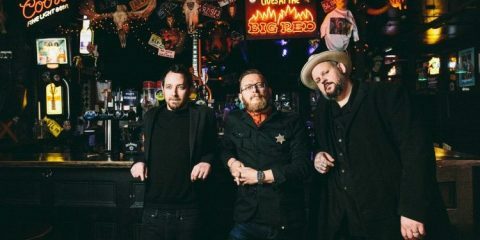 The tell-tale punchy bass tone of Frank Bello provides further motivation to move during the band’s cover of Joe Jackson’s “Got The Time”. 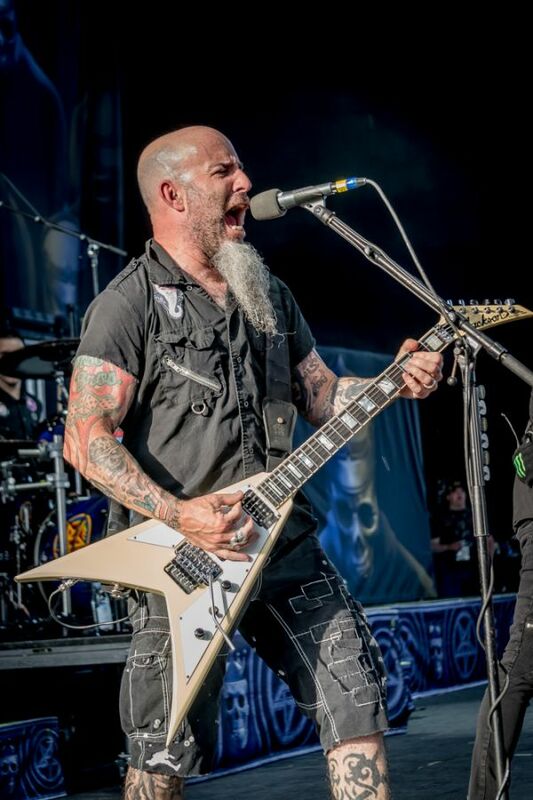 Guitarist Scott Ian is a one-man mosh pit as he dashes about the stage to “Madhouse”. 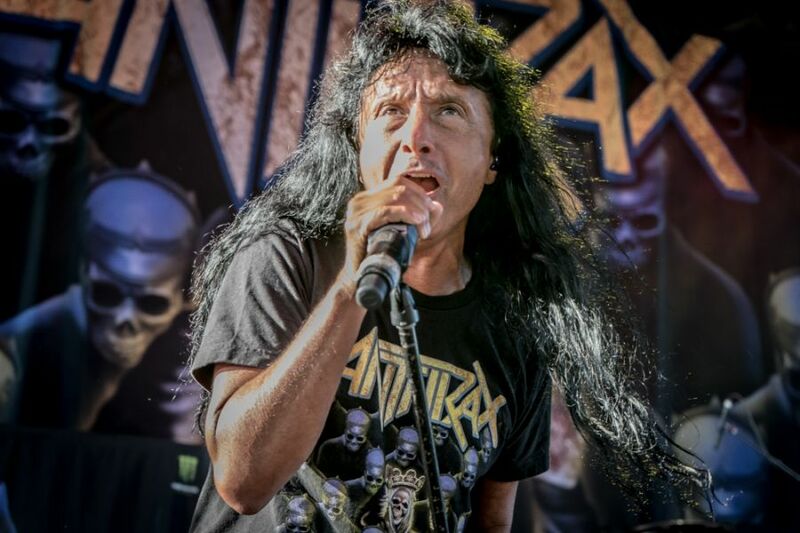 Joey Belladonna’s voice is as strong as ever and, apparently, he is a photographer as well. Reaching down to borrow photographer Joe Orlando’s camera, Joey snaps a few pics of the crowd while singing. 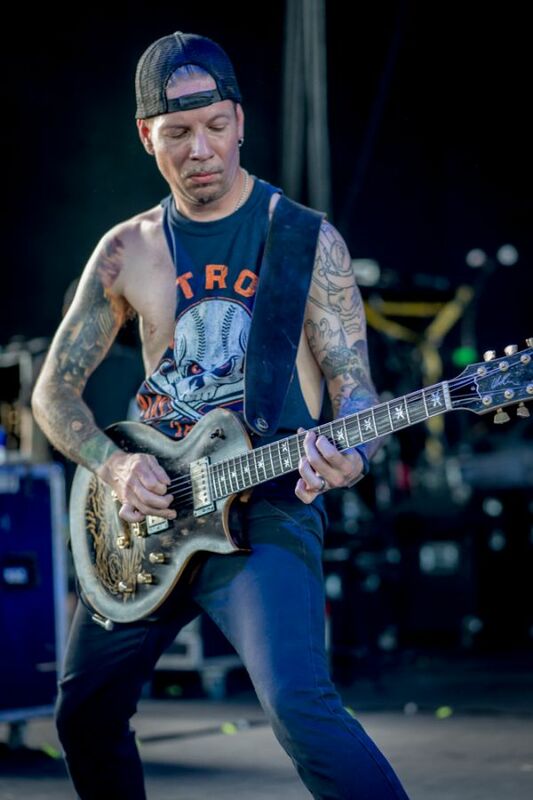 It seems like yesterday that Jonathan Donais joined Anthrax, yet he is well into his fifth year with the band. He lit up the stage during his solo on “I Am The Law”. 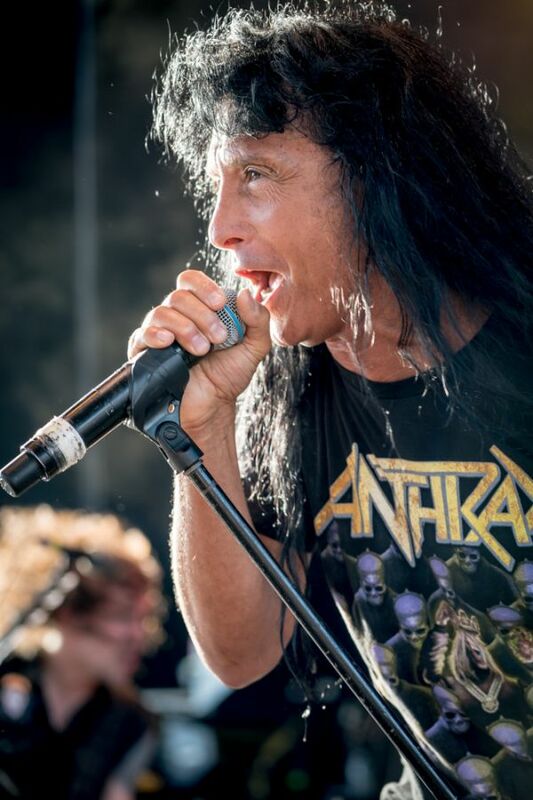 Like Testament, Anthrax are completely engaged with the fans and their performance highlights the show. 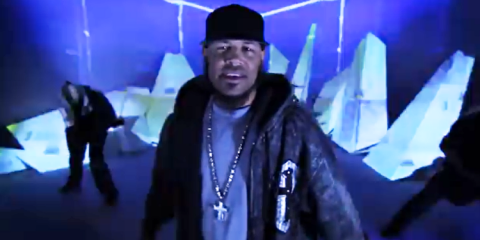 As the spoken word intro to “Omerta” begins, a chorus of fans recite the words in unison amid the cheers. 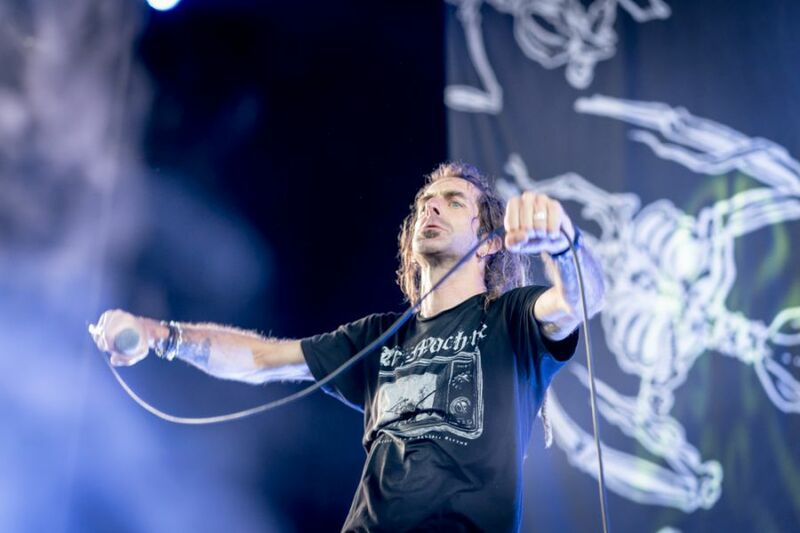 Lamb Of God then explodes on the stage with a metallic barrage that only they can bring. 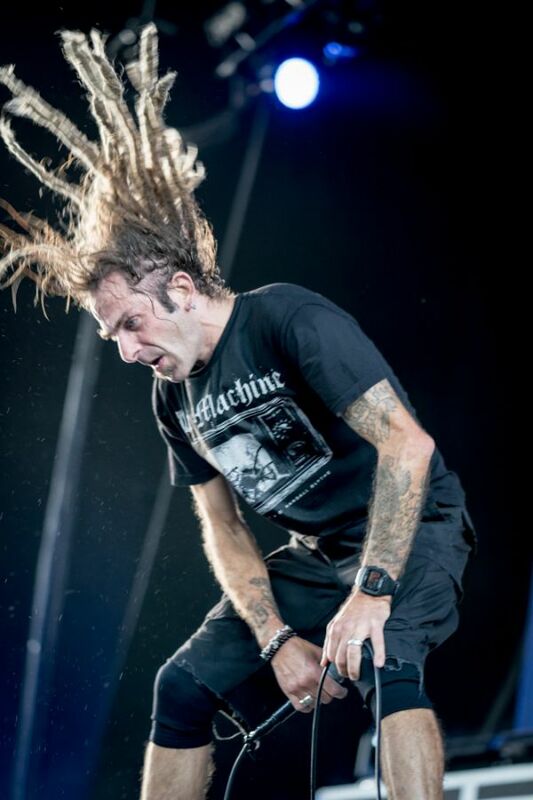 Vocalist Randy Blythe alternately stalks and flies about the stage; coming to rest to growl, scream, and headbang. 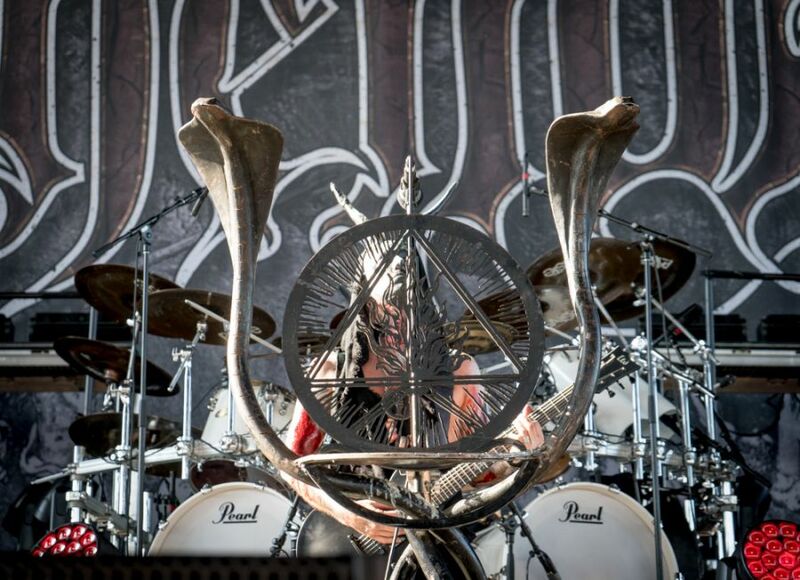 Perched high above the stage, drummer Chris Adler pushes the limits of his kit on “Ruin” and “Laid To Rest”. 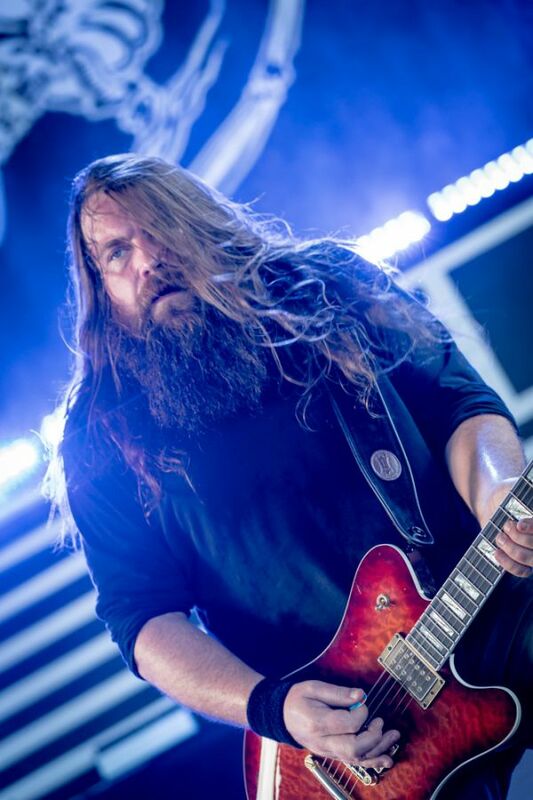 As expected, the mosh pits in front and back on the lawn are in full swing as Willie Adler, Mark Morton, and John Campbell crank the intensity on “Blacken the Cursed Sun”. 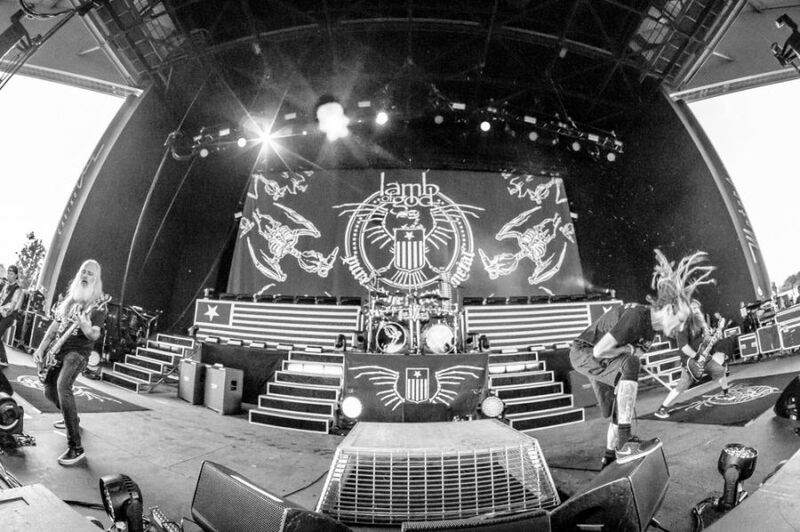 A quick scan of the crowd shows faces screaming the words to “Redneck” as Lamb Of God delivers another dose of pure American metal. A roar fills the air as “Delusions of Saviour” announces the coming of Slayer to the stage. For many, this band sits alone in a place of honor for all the music they have given. 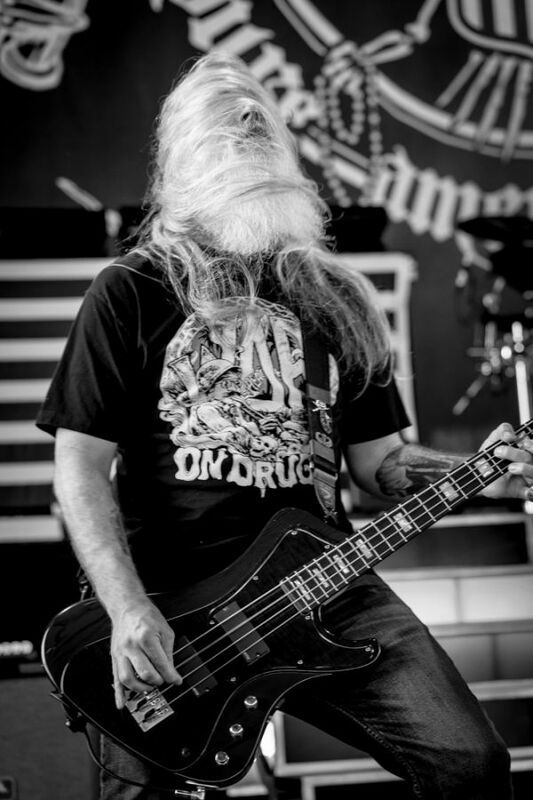 There is palpable excitement rippling through the crowd that sparks a shockwave at the first notes of “Repentless”. 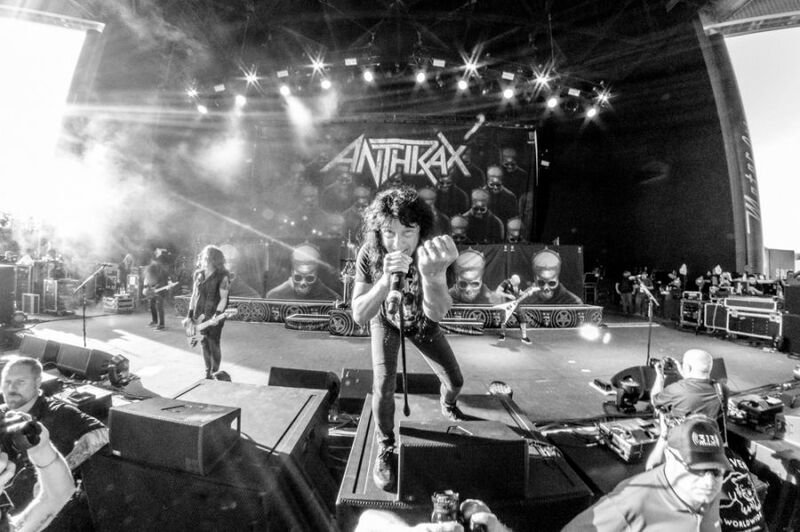 Heads whirl and the action in the mosh pits elevates into a state of metal ecstasy. 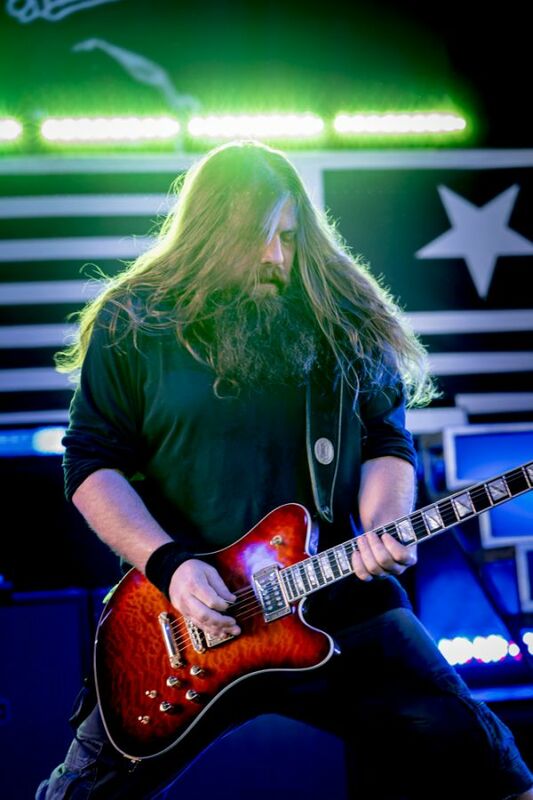 Your mind is stripped clean and only the brilliant burning power of the music of Slayer is left to consume you. 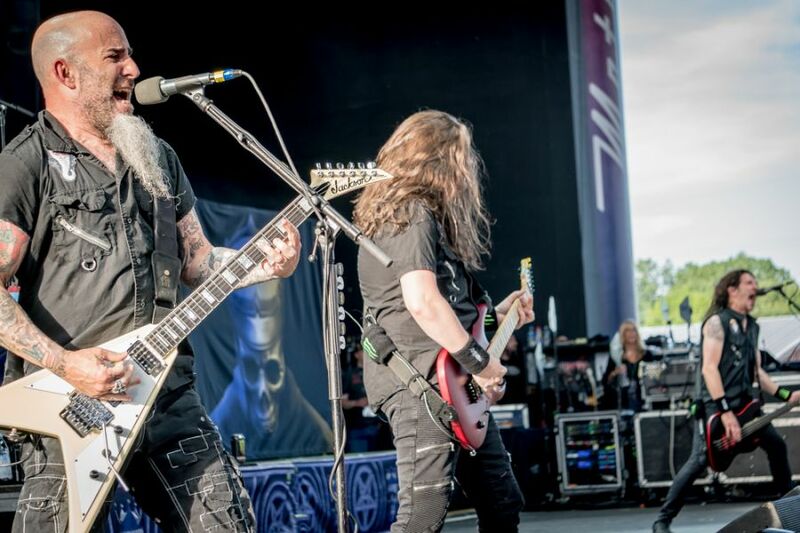 On stage, Kerry King and Gary Holt trade licks on “Blood Red”, “Disciple”, and “Mandatory Suicide”. 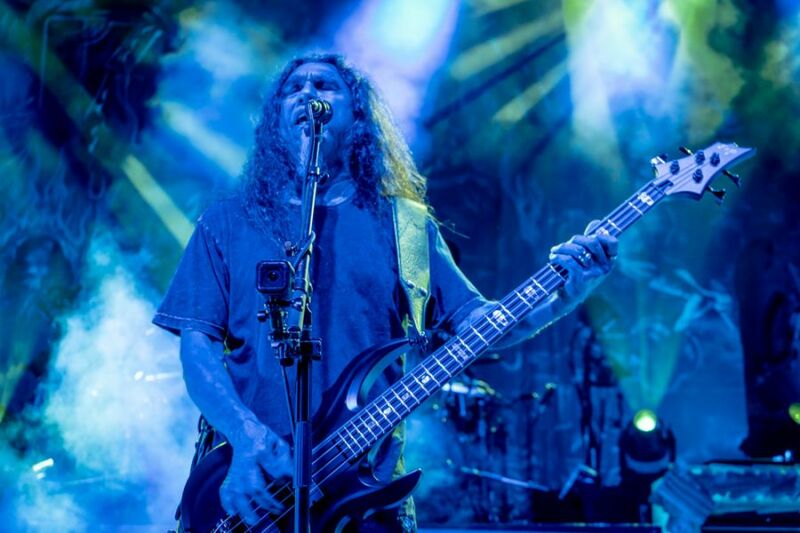 Tom Araya speaks the word “War” and all hell breaks loose during “War Ensemble”. There are few breaks in the action and Tom uses those to smile at the crowd and ask if everyone is having a good time. Deafening cheers let the guys in Slayer know that they are loved. 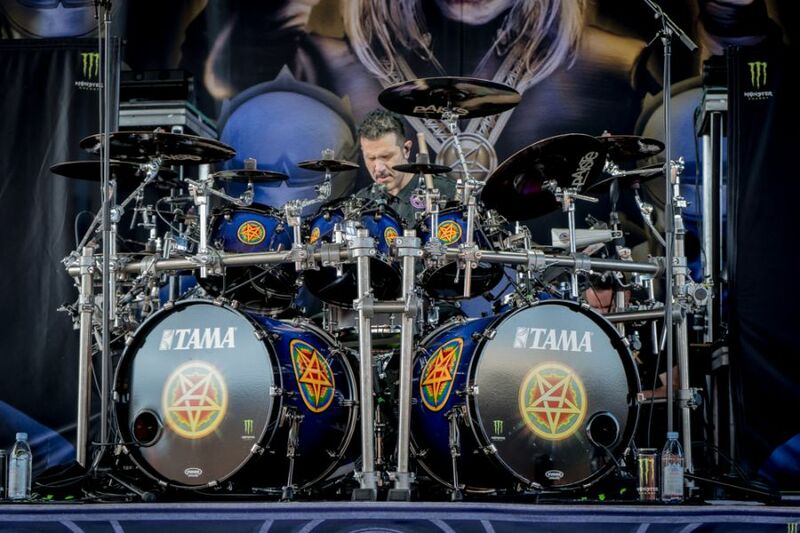 Drummer Paul Bostaph displays the endurance of a marathon runner with sprinters speed through furious tom rolls and blasting kick drum. 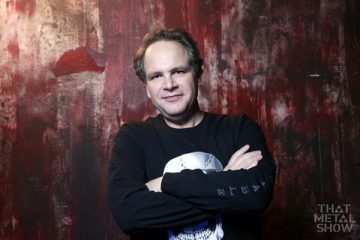 He leads the band into a series of Slayer classics including “Dead Skin Mask”, “Hell Awaits”, and “South of Heaven”. 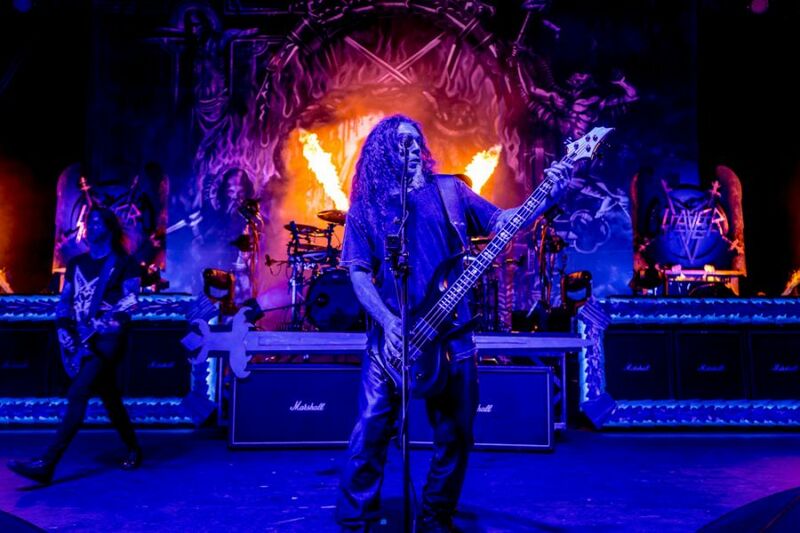 He and the rest of the band must be sweating their asses off as the stage is often consumed by flames. 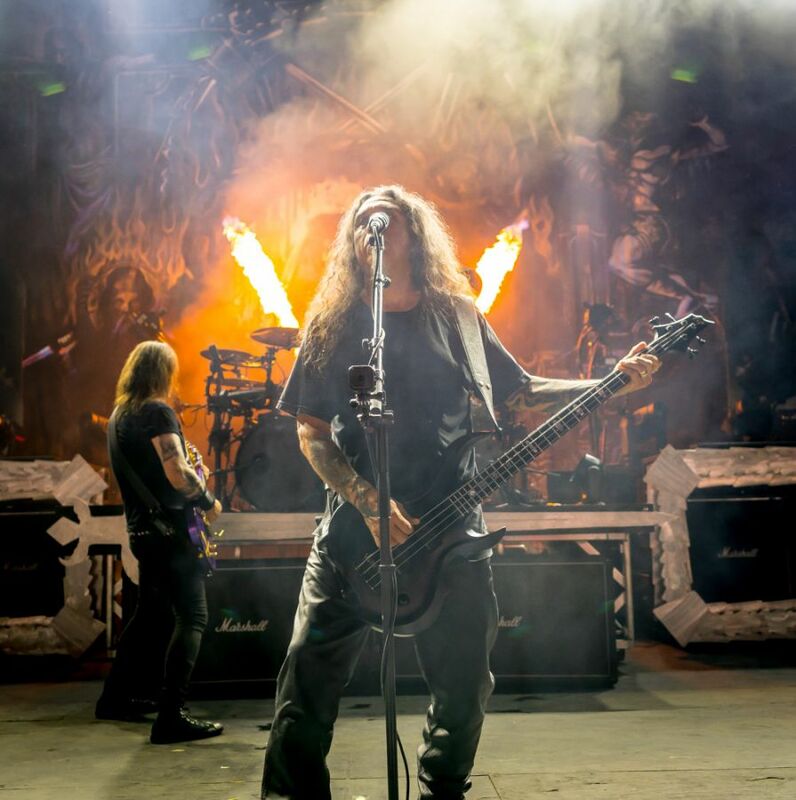 The stage show includes jets of flame crisscrossing the stage in the shape of a pentagram and two long rows of flame flanking the drums which erupt into ten to fifteen-foot bursts of fire. The unmistakable drumbeat of “Raining Blood” drives the mosh pit into a frenzy. You have to marvel at the amount of energy that Slayer fans can generate. The madness continues with “Chemical Warfare” and comes to a crescendo with Slayer finishing the show with “Angel Of Death”. Slayer Fans leave the show in awe and admiration of a band that has given them so many fantastic concert memories. 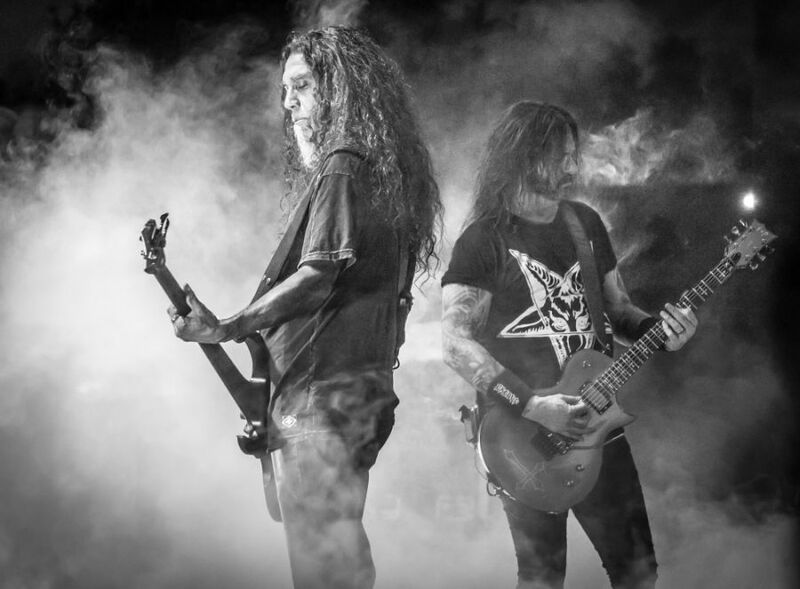 While Slayer may not tour again, their music will always beat strong in the hearts of their fans.